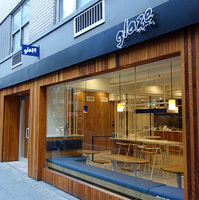 Glaze, a fast-casual teriyaki restaurant, now has a location on Lexington Avenue in Midtown. The modern space features a mix of blue, white and wood elements. The restaurant is known for its teriyaki bowls, served a Seattle style, with a choice of protein (chicken, pork, steak, salmon, veggie etc), white or brown rice, and three different dressings (sesame, carrot ginger, and honey lemon). Salads are also available along with cold soba noodles, charred pork ribs and crispy gyoza dumplings.